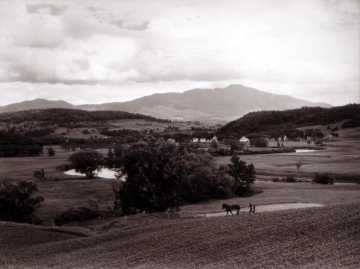 The historic image shows a broad view of a valley with a river and open fields. A man and boy plow a field with a horse drawn plow in the foreground of the image. There are more open fields and a meandering river beyond the crop field. The river's riparian zone is mostly bare with a cut bank. There are scattered trees, including elms, in the open fields. Buildings form a town in the center of the photograph. There is a forested mountain in the background of the image. 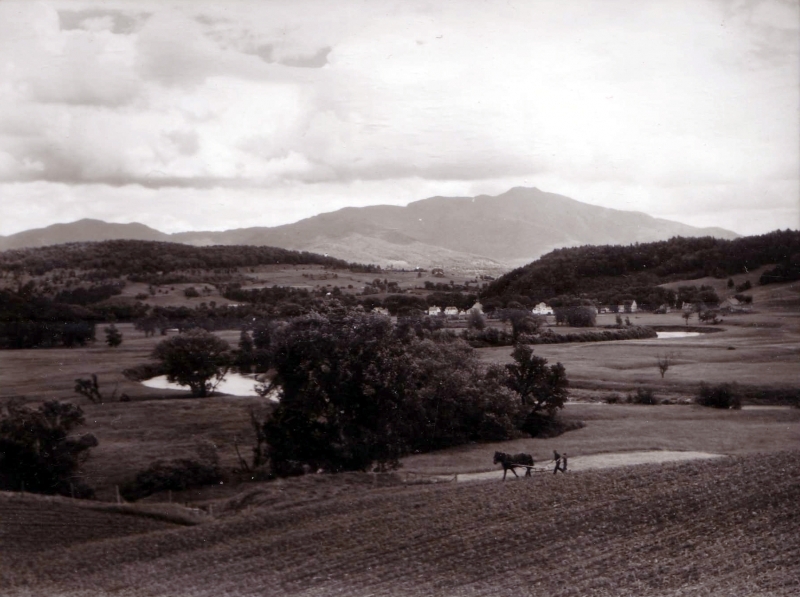 Esther Munroe Swift writes on 2005-2-4: This is a well known Vermont image from the Works Progress Administration, whose photographers took thousands of photos of what life & work was like in all the states during the Great Depression. Also written were the Writer's Guides to all the states, which recorded equally well in text what life was like in that period. To quote about the Vermont volume from the agency: "Vermont: A guide to the Green Mountain State, American Guide Series, 1st. ed was produced during the mid-1930's by writers, reporters & editors of the Federal Writers' Project of the Works Progress Administration under the general direction of Harry Hopkins." NOTE: there are (were) location uncertainties with this image. It was originally entitled, "Farmland in front of Jay Peak" but Allaire Diamond (Field Naturalist program UVM) writes on 2008-03-16 that...while perusing the wonderful resource of the Landscape Change website, I came across two photos that appear to have been taken within minutes of each other, yet have different locations recorded. The photos are LS00523_000.jpg, which says it is taken in Highgate, and LS02135_000.jpg, which says the location is Cambridge. It looks like both photos were taken across the river from where the Boyden Valley Winery is today, at the junction of routes 15 and 104. Jenny Schwartz writes on 2008-07-18: photo is taken from the crest of Sweet Road looking east towards Pumpkin Harbor Road and the wrong way bridge.